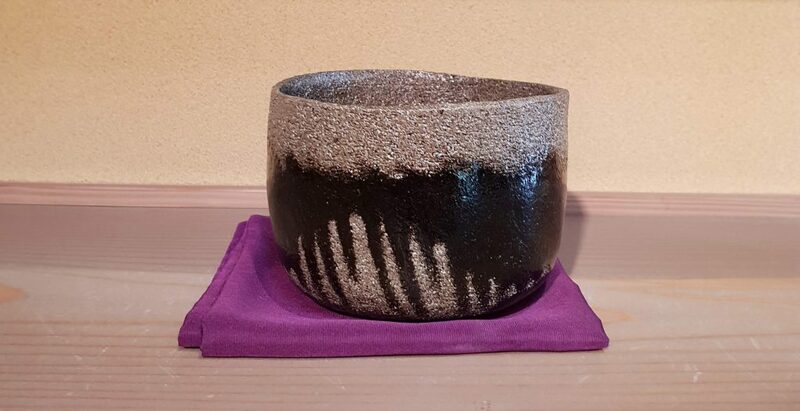 During my trip to Japan last October 2018, I met a Master potter in his studio named Kyoshitsu Sasaki. His family lives near Kyoto, in the traditional city called Kameoka. He was very friendly and showed me his studio, kilns and work. Mr. Kyoshitsu Sasaki and I kept in contact and he is willing to come to The Netherlands and give a workshop here, showing for the first time in Europe the technique of Kurinuki. Kurinuki means emptying the inner-side of a pot. It is a very old Japanese traditional way of working with clay. You start off with a block of clay that you will work on with tools to empty the pot progressively, slowly making the Chawan (tea bowl) thinner and lighter. This approach is also seen as a Zen meditation kind of working process, as it means emptying your mind from any thought as you empty the teabowl. During the weekend, Sasaki will be accompanied by Nessim Cohen, one of his students, who will help with the translation and tea ceremony at the workshop. Mr. Sasaki is the fourth generation of a family of potters to practice the Kurinuki and Raku firing of Chawans. His family has been given the name “ShouRaku” by the Japanese authorities, the inclusion of the character “Raku” implying that the family’s work is recognized as very important for the traditions and evolutions of Japanese arts. To this day, only seven families have received the name “Raku” in Japan. The artist name Kyoshitsu means “Empty Room” in Japanese. Just like the technique of the Kurinuki, it implies that Sasaki aims at emptying his mind. It is at the heart of the Zen practice of meditation. This name has been given to him by one of the high-priest of Daitokuji in Kyoto, one of the most important Zen temples of Japan. Sasaki fires his Tea bowls with extreme care. No more than 5 at a time in a gas oven. Today, his works have been recognized in Japan by the highest tea masters of the main schools and by the artistic community as leading works to bridge the gap between tradition and modernity. The weekend workshop will take place during a Saturday and a Sunday, 17 and 18 augustus 2019. Zaterdag 19 en zondag 20 mei / 23 en 24 juni / 30 juni en 1 juli as. Op 16 en 17 december 2017 kun je mijn werk kopen op de Kunst en Ambacht Winterfair in Naaldwijk. Je kunt je nu inschrijven voor verschillende workshops deze zomer! 5-6-7 juli 2017 – inschrijving gestart!